I&E Cabinets did this Kitchen! When you are presented with pictures be careful of all the glossy picture perfect, always with the perfect lighting and angles. Are those their real clients? Also remember, professional photos are a hallmark of a professional company but they can also be very misleading and hide true details. Los Angeles is known around the world for Hollywood stars, glamor, and, well, it being expensive to live here. For the price of a house here, in some places you could buy a mansion. I&E Cabinets knows when you choose to reface your cabinets instead of remodel your entire kitchen or bathroom it is because you are wanting to not spend a small fortune. When we finish with your cabinet refacing, your cabinets will look like new anyway. 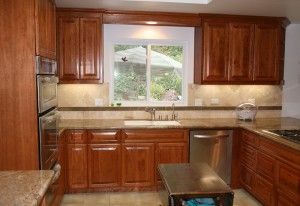 Kitchen cabinet refacing takes less time and your house is back together in no time at all. Bathroom cabinets being refaced, also called resurfaced, are done even quicker. Whether you are in Thousand Oaks, Van Nuys, or Riverside, it doesn't matter. We serve anywhere in Southern California for cabinet refacing! Cabinet estimates are always free. If you want more than affordable cabinet refacing, we have that. Floors, lights, plumbing. We do entire rooms. Walls, wiring, doors. For commercial cabinet installs we've even done elevators!